Yorkshire. It's in a funny U-shape, as if it really wants to get to Leeds city centre, but then gets to the edge of it, doesn't like what it sees and runs away again. Well, I can hear the screams of outrage coming from Yorkshire right now. It's not that bad per se, but quite frankly, any motorway that drops down to a single lane at any point is worthy of note on here, isn't it? Don't bowl me over with all your enthusiasm now, will you? I'll try not to. Now, why is it in such a funny shape? The M621 is a bit like the M25, two different motorways bodged together into one. 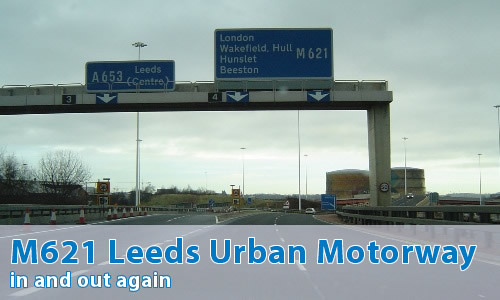 The section from the M62 to junction 3 was constructed as the Leeds South West Urban Motorway. This was intended to be a simple connecting link to the centre of Leeds from M62 in the direction of Manchester, as well as commuting into the centre from surrounding towns such as Batley. This motorway went through the proposal phases with the number M65, but this was changed to M621 before opening. The remainder of the motorway was constructed as, yes, you've guessed it, the Leeds South East Urban Motorway. Once again, it was designed to get traffic into Leeds city centre, but this time from the south east and the M1. This section, despite it being built and maintained by Leeds City Council, was part of the M1, and indeed formed its northernmost section for 25 years. Both motorways basically dumped all of their traffic on a roundabout in central Leeds. Not exactly ideal, really. No, I don't suppose it was. What happened to change things? Oi! Back on topic, please! Oh yes, sorry about that. Anyway, after years and years of faffing about, a link road was finally built between the M1 at Belle Isle and the A1 at Hook Moor - which opened as part of the M1. Oddly perhaps, given the expense caused by the construction of the road in the first place, the cheap option was taken and so you have to turn off the M1 in order to stay on the M1, if you see what I mean. The little left-over bit of M1 heading into Leeds was then given the M621 number (despite seemingly having the numbers M100 and M101 both already reserved for it), and the present junction 3 was tidied up a bit so that it was actually possible to go between the two halves of M621 sensibly. Yeah, it pretty sensible if you head from west to east. However, if you go from east to west, it's all a bit mad really. The first you know that anything weird is going on is when there's a bunch of yellow signs saying "HGVs allowed in all lanes" - which of course is actually illegal, as it's three lanes wide at that point and HGVs are not allowed in the right hand lane if there's three or more lanes. The reason for this soon becomes clear - only the righthand lane continues as M621, all the others being marked as exit lanes. Before long, you're on a short section that's only one lane wide before there's an entry from the right hand (or "wrong") side, and the motorway continues southwestwards being all dull and sensible again. To be fair, it's not really a problem. The vast majority of traffic on M621 is indeed heading towards or away from Leeds city centre, and there isn't that much travelling all the way along the motorway. To be fair, I can't think of a single reason (bar serious congestion on the section of M62 between M621 and M1 that anyone would actually need to use the entire motorway. Even the junction layouts at either end prevent it from becoming anything other than a route to and from junction 3. Can I see some photos then? Of course! And as an added bonus, there's a video of the entire M621, travelling from east to west.